Because we love our products everyone of our team wants to get the latest version installed to benefit from latest changes or simply to play around with new features. This is great! But it means a lot of maintenance though, doing all those setups and configuration in the morning when there’s a new nightly build available. Generally, an installation is a process that has quite simple rules. You provide all the necessary information the installer file needs, beginning with the target directory, database connection strings or IIS website names and the windows installer services does the rest. The good thing is, that those information normally don’t change if you do a software update. All installers support a parameter system that allows you to add those settings as arguments to the installer execution call. That’s a good start for the DirectSmile Installation Service. The general purpose of this service is to run installations and uninstallation of a DirectSmile product in an automated way. In development we coupled the DirectSmile Installation Service with Jenkins, the continuous integration server, we are using. Using this technology for a while now enables us to do builds on each check-in and run tests immediately on staging servers, where even the new installer is deployed to. The DirectSmile Installation Service application consists of two parts. A server component which is installed on the machine that should be automatically maintained. And a client component that has all the client specific configuration data and automates the installation service remotely. 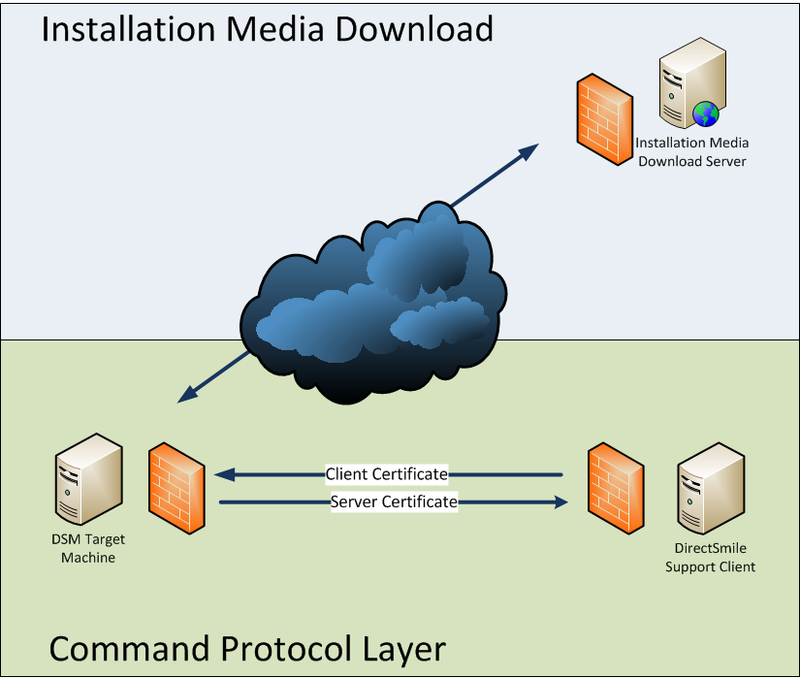 The client and the server communicate through SSL secured tunnel. The communication can only be established if the client identifies the server and (much more important) if the server identifies the client. This is covered by client and server certificates. The installation file itself can be either downloaded by the service from a trusted http download server, or from the local file system. While the installation service is a windows service component the client is a windows command line application. Usually a installation product code is a GUID. To make it more convenient to deal with product code we created some shortcuts for the DirectSmile products and you can use Product Name representational string instead. Those are: dsmi, dsmg, dsmx, dsmstore, smartstream. Running an installation is quite easy. All you need to provide the Url, where the installation file can be downloaded and all parameters that are needed by the installation process. This command would download the installation file for the DirectSmile Card & Giftshop and execute the installation. While this installation is running the DirectSmile Watchdog would be stopped. To do an uninstallation the product code is needed, but we can use our product name shortcut here again. You can also pass a list of processes and services that should be stopped before the uninstallation. This command would do an uninstallation of DSMI, but first it would stop all running ProductionServer instances and the DirectSmile Watchdog. It also would stop the DSMOnlineBackend service. The installation service can do a backup a directory. This directory will be zipped automatically and place i n the destination directory you name. The command would create a backup of the web application directory of the DirectSmile Shop and copy the zipped archive to c:\temp. The client comes with a config file that includes a default endpoint url to the installation service. Usually you don’t want to change that, but if you have several products installed on different machines, you might want to use the same client to handle all of those installationes. In this case you could pass the service endpoint url as an argument in the installation client call. This sample would would retrieve the DSMX product version from a specific service running on a server called <server>. The DirectSmile Installation service writes a log file. This log file can be downloaded to the client. This command would download the log file from the server and stores it locally on the client machine.